Roasted Beets…not Beef. This salad is simply stupendous on a hot, summer day. 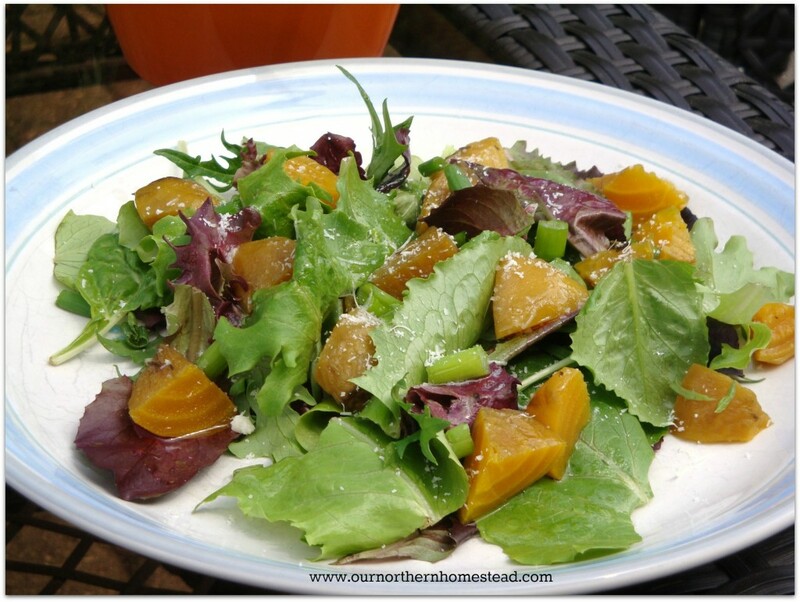 It is cool and refreshing and takes advantage of fresh, in season beets. Here is your opportunity to use different kinds of beets too, experiment with orange or candy cane varieties. The presentation of this salad lends itself well to a Sunday brunch with guests. They will rave at the taste while not knowing how simple it is to throw together. Toss beets with 1 Tbsp olive oil and the dried thyme; roast at 350°F until tender, about an hour. Remove from oven and cool completely (can be done the day before and kept in the fridge until needed). Arrange mixed baby greens on a plate, sprinkle with green onions. Cut beets into smaller chunks and add to salad. In a separate bowl, whisk remaining olive oil and white balsamic vinegar; pour over salad, sprinkle grated Parmesan over top and serve with a crusty roll.